Background: The shooter's performance was mainly depends on the accuracy of the target. Physical and psychological health (anxiety, irrational belief) helps to achieve target. There is no study to find the irrational belief among elite level shooter. Purpose: The aim of this study is to find the prevalence of irrational beliefs among the elite shooters. Methods: A cross-sectional survey was conducted among 21 professional shooters (14 female and 7 male), and data of irrational beliefs were collected by Short General Attitude Belief Scale was administrated among them. Results: The result shows that elite level shooter has irrational belief about their performance. In irrational belief, demand for the fairness of the performances (3.13 ± 0.89, 65%) and need for achievement (2.97 ± 0.93, 60%) were higher percentage than the other irrational belief. Conclusion: In irrational belief, demand for the fairness of the performances and need for achievement was higher percentage than the other irrational beliefs. الخلفية: ان أداء مطلق النار يعتمد أساسا على دقة الهدف. بالإضافة الى ذلك ان الصحة البدنية والنفسية (القلق، والاعتقاد غير العقلاني) يساعدان على تحقيق الهدف. ولا توجد دراسة للكشف عن الاعتقاد غير العقلاني بين مطلقي النار المتميزين. الهدف من هذه الدراسة هو العثور على مدى انتشار المعتقدات غير العقلانية بين الرماة المتميزين. المواد والطرق: أجري مسح مقطعي بين 21 من الرماة المحترفين (14 أنثى و 7 ذكور)، وجمعت المعتقدات غير العقلانية بواسطة معيار المعتقدات العامة القصيرة. النتائج: أظهرت النتيجة أن مطلق النار على المستوى المتميز لديه اعتقاد غير عقلاني حول أدائه. في الاعتقاد غير العقلاني، كان الطلب على عدالة الأداء (3.13 ± 0.89، 65٪) والحاجة إلى الإنجاز (2.97 ± 0.93، 60٪) نسبة أعلى من الاعتقاد غير العقلاني الآخر. الخلاصة: في الاعتقاد غير العقلاني، كان الطلب على عدالة الأداء والحاجة إلى تحقيق انجاز كان نسبته أعلى من المعتقدات غير العقلانية الأخرى. Shooting is one of the competitive individual sports consist of Pistol, Rifle, and Shotgun for shooting. Shooters require technical training apart from high demand of physical and mental skill training, and their performance is based on the accuracy of their target. They were regularly under the training of technical but does not consider much about psychological skill. According to Heinz Losel's, “the poor performance of shooting is not because of dreadful trembling. It is purely due to the emotional eruption that affects concentration and ability to observe, which brings about a change in the muscular tension such as hypotonia or hypotension. In another word, it causes a discrepancy in the tonicity of the agonistic and antagonistic functions of the muscles, plays a major role here.” This clearly states the importance of physical and psychological health for shooting. The accuracy depends on several factors such as postural balance, breathing techniques, ammunition dimensions, novice and expert shooters, length and weight of the rifle, and biomechanical interactions in the human-rifle system. In Olympic 2008, the winning score of rowing was slightly higher than others scores. Such atmosphere creates a pressure about performance on the elite level players who have scored less, and the athletes have developed negative perception about successes during competition. These negative thoughts could develop anxiety and decreases their performance level. Elite athletes are well known to manage the anxiety even though they have experience of precompetition anxiety. Because they could able to eliminate negative thoughts from their mind. Albert Ellis and Dryden suggested that the psychological health depends on rational and irrational belief of an individual. Dryden and Branch define characteristics of rational beliefs are flexible or nonextreme, consistent with reality, logical largely functional in their emotional, behavioral, and cognitive consequences and largely helpful to the individual in pursuing his basic goals and purposes. The irrational belief characters are typically opposite in nature of rational belief, and it is mainly detrimental to individual goals. The rational beliefs are categorized as preferences, anti-awfulizing, high frustration tolerance, and self/other acceptance. The irrational beliefs also categorized into demandingness (i.e., absolutistic/inflexible requirements), awfulizing (or catastrophizing), frustration intolerance (or low frustration tolerance), and global evaluation of one's own person (self-downing), other persons (other-downing), and/or the life situation (life downing). In REBT theory, the irrational belief becomes maladaptive behaviors such as social avoidance, self-harming, procrastination, anger suppression, aggression, violence, and decline once achievements. Whereas, in stress-activating situation, the irrational beliefs are hypothesized to engender dysfunctional emotions (unhealthy anger). Athlete's rational beliefs could lead to the success of the performance. However, irrational belief could lead to demands for the success. A meta-analysis about irrational belief and professional distress concludes the moderate relationship between irrational beliefs and psychological distress. Another report says that the patient who has irrational beliefs showed to increase the diastolic blood pressure and huge increased of anxiety level. Patients those who have rational beliefs showed increase in the systolic blood pressure. These beliefs can be quantified by numerous scales. Among them, Short General Attitude Belief Scale (SGABS) provides a brief measure of beliefs that has good test–retest reliability (r = 0.91) and good construct, criterion, concurrent, convergent, and discriminant reliability. The SGABS contains 26 statements in the form of 7 subscales and assesses both rational (1 subscale) and irrational (6 subscales) believes. Respondents are required to rate their agreement on a 5-point Likert-scale from 1 (strongly disagree) to 5 (strongly agree). An average is calculated for each of the subscales, by dividing the total scores of each subscale by the number of items in the scale. Total irrationality is computed based on the total sum of the irrationality subscales alone with higher scores indicating more irrational beliefs of a greater intensity. The previous studies on SGABS were mostly concern about team performance than individual performance sports such as academic soccer,, elite youth cricketers, Mixed Martial Arts athletes, pin bowler, and a single-case study of archery. These studies were focused to identify the effect of behavioral therapy, but no study was discussed or measured about the prevalence of irrational belief in shooters. Sports are mainly based on successive performance which can affect by athletes mental status, especially individual sports such as shooting. This makes an urge find the prevalence of irrational beliefs and its most affected subcategories among elite level shooter. A cross-sectional survey was conducted with 21 professional shooters (14 females and 7 males) from Badal Village and Govind National College, Ludhiana shooters range, Punjab, India. Written consent was obtained before the selection consent. The shooter who has elite level performance (national and international level) in regular competition with age of 16–30 years, of both gender and participants who have able to understand and communicate in English were included in the survey. Whereas, the professional shooters who were unwilling to participate, irregular in practice, early learner, and history of recent injury or pain, those who are under psychological skill training such as autogenic training, Yoga/Meditation, music therapy, and any other relaxation training were excluded. The participants were instructed to sit in a quiet, proper lighted room. Followed by this, the demographic data of shooters was gathered, and the SGABS was administered on them and instructed to return the form 30 min later. All the data were analyzed by using the statistical software, Statistical Package for the Social Sciences, version 16.0 (SPSS Inc., Chicago, IL, USA). The descriptive statistics were expressed as, mean ± standard deviation (SD) and percentage (%). The mean of each irrational belief was tabulated in [Table 1], which shows demand for fairness and need of achievements irrational beliefs were high among elite shooter. The percentage of irrational belief is displayed in [Figure 1]. 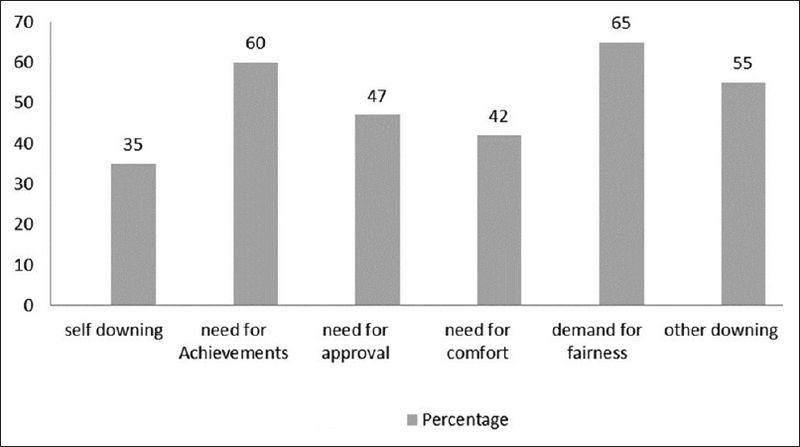 Shooters have 65% of demand for fairness and 60% of need of achievement. They had the least percentage (35%) of self-downing beliefs. Twenty-two participants were included in this survey, but one participant was unable to complete the assessment form. Our aim was fulfilled by this result, and that shows the primary irrational belief of demand and fairness was higher percentage than other irrational belief. They have been need of achievements in their performances and high demands for achievements. The athletes have mainly concentrated their technical training and physical training, but they were facing lack of psychological training. Craft et al., determined increased influence of cognitive and somatic anxiety in individual sports than team sports and that cognitive anxiety affects the performance of an open-skill player who plays in changing o environmental condition and lower skill players. A study of irrational belief on person who was diagnosed with mental health problem had concluded that need of achievements is the main issue for developing other irrational beliefs of a person. In the sports setting, the player has demand for fairness because there was a need of achievements. The previous studies were conducted on team game players and less 10 participants in these studied. They had reported irrational belief about their performance. Turner and Barker have noticed that reduced performance when anxiety level high among youth cricketers. According to Turner et al. reported that mean of demand for fairness and need for achievements were more than other irrational beliefs before intervention in elite soccer academy athletes who were competing under 15s team. Another study of Turner et al. has noticed that irrational beliefs of the need of achievement, demand, and need of approval are high-level among professional academy soccer athletes competing under 18s team. The current study result was also reflect the same result such as irrational belief demand and fairness, need of achievement They were documented irrational beliefs affects the performance of an athlete's. However, three semi-professional mixed martial arts athletes have more self-depreciation irrational belief reported by Cunningham and Turner. Elite level pin bowlers had lack of performance in their competition due to the irrational belief of high ego and high-task orientation. There was a single-case study conducted on archery. Archer also has primary irrational beliefs of demand for fairness, and it was identified by Wood et al. Another study was conducted an open source online survey on mental health in 244 elite Australian athletes and reported that half of them suffered with any one of mental health disorders, depression, and anxiety being more prevalent among them by Gulliver et al. All the level of athletes who have precompetition anxiety due to irrational belief or negative thoughts about their performances. The future study will be focused on finding the type of irrational beliefs with a large sample and various levels of players, compare the irrational belief on gender differences. This survey was concluded that elite level shooters have irrational beliefs. In irrational belief, the primary irrational belief of demands for fairness and one of the secondary irrational beliefs, need for achievements were high level which may affect their performance. The authors are very thankful to Mr. Asir John Samuel, BSc (Psychology), BPT, MPT (Neurosciences and Pediatric Neurology), DYScEd, MAc (PhD), Associate Professor, Department of Pediatric and Neonatal Physiotherapy Maharishi Markandeshwar Institute of Physiotherapy and Rehabilitation, Maharishi Markandeshwar University, Mullana, India, for providing technical support and content review. Lösel H. International Shooting Sport Federation Competitive Sport Shooting Practical Sport Psychology Chairman ISSF Medical. 2nd ed. Munich: Germany; 1999. Available from: http://www.issf-shooting.org. [Last accessed on 2017 Mar 08]. Tor E, Ball K, Pease D, Hopkins W. Shooter's Posture in Handling a Rifle While Aiming at a Target in Standing Position. 30th Annual Conference on Biomechanics in Sports: Melbourne; 2012. p. 188-91. Birrer D, Morgan G. Psychological skills training as a way to enhance an athlete's performance in high-intensity sports. Scand J Med Sci Sports 2010;20 Suppl 2:78-87. Weinberg R, Gould D. Foundations of Sport and Exercise Psychology. 6th ed. Illinois: Human Kinetics; 2015. Ellis A, Dryden W. The Practice of Rational-Emotive Behavior Therapy. 2nd ed. New York, NY: Springer Publishing Company; 2007. Dryden W, Branch R. The Fundamentals of Rational Emotive Behaviour Therapy. 2nd ed. England: John Wiley & Sons; 2008. Available from: http://www.life-soulutions.org/uploads/4/7/6/2/4762488/fundamentals_of_rational_emotive_behaviour_therapy_a_training_handbook.pdf. [Last accessed on 2017 Mar 08]. Ellis A. Reason and Emotion in Psychotherapy: A Comprehensive Method of Treating Human Disturbances. Revised. New York: Citadel Public Relations; 1999. Vîslă A, Flückiger C, grosse Holtforth M, David D. Irrational beliefs and psychological distress: A Meta-analysis. Psychother Psychosom 2016;85:8-15. Harris S, Davies MF, Dryden W. An experimental test of a core REBT hypothesis: Evidence that irrational beliefs lead to physiological as well as psychological arousal. J Ration Cogn Ther 2006;24:101-11. MacInnes D. Evaluating an assessment scale of irrational beliefs for people with mental health problems. Nurse Res 2003;10:53-67. Lindner H, Kirkby R, Wertheim E, Birch P. A brief assessment of irrational thinking: The shortened general attitude and belief scale. Cognit Ther Res 1999;23:651-63. Turner MJ, Slater MJ, Barker JB. Not the end of the world: The effects of Rational-Emotive Behavior Therapy (REBT) on irrational beliefs in elite soccer academy athletes. J Appl Sport Psychol 2014;26:144-56. Available from: http://www.tandfonline.com/doi/abs/10.1080/10413200.2013.812159. [Last accessed on 2017 Mar 08]. Turner MJ, Barker JB, Slater MJ. The season-long effects of rational emotive behavior therapy on the irrational beliefs of professional academy soccer athletes. Int J Sport Psychol 2014;45:429-51. Cunningham R, Turner MJ. Using Rational Emotive Behavior Therapy (REBT) with Mixed Martial Arts (MMA) athletes to reduce irrational beliefs and increase unconditional self-acceptance. J Ration Cogn Ther 2016;34:289-309. Craft LL, Magyar TM, Becker BJ, Feltz DL. The relationship between the competitive state anxiety inventory-2 and sport performance: A meta-analysis. J Sport Exerc Psychol 2003;25:44-65. Hemmings B, Holder T, editors. Applied Sport Psychology: A Case-Based Approach. London: John Wiley and Sons Ltd; 2009. Wood AG, Barker J, Turner MJ. Developing performance using Rational Emotive Behavior Therapy (REBT): A case study with an Elite Archer. Sport Psychol 2017;31:78-87. Gulliver A, Griffiths KM, Mackinnon A, Batterham PJ, Stanimirovic R. The mental health of australian elite athletes. J Sci Med Sport 2015;18:255-61.